No matter how extraordinary a service you provide, somewhere along the way you will meet difficult customers. We know something about it. Difficult customers are as inevitable as a cold and rainy autumn after a nice and warm summer. You just have to deal with it, best by preparing your mindset for it. There are two ways to think about difficult customers. One is that the customer is always wrong. And you don’t have to listen to them, because everything is allright without service. The second approach is to spend some extra time with every difficult customer. You listen to them carefully and explain your product. But at the same time, you’re not scared to consider the possibility of them being actually right. In both approaches, you’ll need to learn something about handling difficult customers anyway. You can achieve that by understanding their personality types and their way of thinking better. Here are 4 types of difficult customers explained using situations that happened during our chats. Plus, advices on how to deal with them. Like every business, we sometimes experience big issue, such as DDoS attacks. It takes time to fight them off and it mostly doesn’t depend on us. Mr. “I want it now” comes to chat and thinks we have something like a “fix” button, and he can’t understand why we don’t use it. The longer I think about it, the more I believe that Mr. “I want it now” type of customer doesn’t understand that not everything can be done. It’s not that he is a mean person in general, forcing you to do something that can’t be done. It’s just things are simply not as he imagined. So he threatens to leave, but it often means that he is insecure with his own business. Be patient and never respond with emotions. Wait for the customer to calm down and explain in respect to his or her situation. Learning to say no to a customer can also be useful. From what I’ve learned in life, it’s really hard to satisfy people who are complaining. It’s not because you can’t solve their problem, it’s because they are constantly creating new problems themselves and keep on complaining about them. It’s just their nature. They don’t like the feeling of being happy and satisfied. This customer type comes to chat and has a grudge about any changes in our application. He can’t understand that we evolve and need to redesign the look of our app. He complains about it and claims he loved the older version. Yet, he forgets about the changes after a week. He gets used to the new look, falls in love with it and can’t remember the previous one. Even if sometimes you’ll manage to fix “the problem”, complaining customers might not even notice it. One thing is sure – pretty soon, they will find another “problem”. It’s because of their personality type – they’re grumpy. And speaking of grumpy – their face and mind is not different from the grumpy cat. You don’t expect a grumpy cat to appreciate something and be pleasant, right? You watch the memes and laugh out loud. Try this approach with the complaining customer. Don’t forget to laugh inside. It’s funny because usually the problem is a lazy service. But what about the lazy customer? Have you met one? Mr Lazy wants to do as little as possible on his own. He expects that you’ll do everything for him. He pays you, so sometimes he requires that you do a little more for him. Usually he doesn’t want to overuse the authority though. He is just a lazy person in general. You can’t expect any initiative from him in doing things he doesn’t feel like doing. Sometimes we have a situation when a client doesn’t want to take care of his invoices from LiveChat. He comes to chat and asks us to send the invoice to his accountant for him. Laziness is just a habit. It means it can be changed. In our case, Mr. Lazy needs to make a habit out of sending invoices to the accountant. We can teach him that it’s easy to do and it takes only a few minutes. If he does it a few times, chances are he will form a new habit. And he will take care of his invoices every month. Does it mean that you shouldn’t go the extra mile for a customer when he asks you to? Well, it all depends on the situation. I’m a big fan of doing a little extra for a customer but within reason. Whatever you decide, keep in mind, should Mr. Lazy get used to your help it will be hard to teach him to do differently. 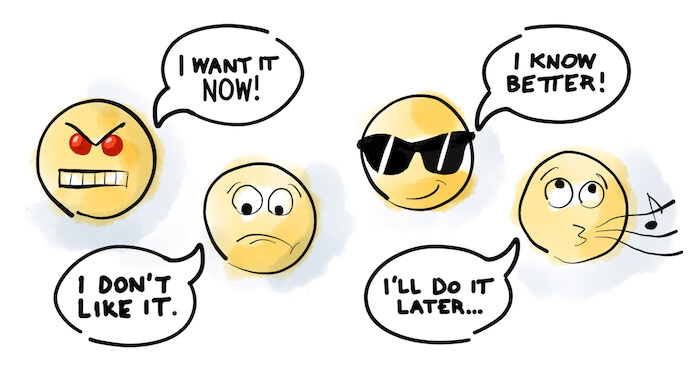 This customer type doesn’t have to be a mean or angry customer, like Mr. “I want it now”. But he surely has an issue with accepting the answer he doesn’t like. The arguments don’t get to him. He is convinced of being right and it’s almost impossible to change his beliefs. A customer claims on chat that some features don’t work right. After looking into it and explaining that everything works fine, the customer simply doesn’t agree. He quits the chat and comes back later hoping another agent will give him a different answer. In most cases everything is working OK. The problem is that a customer doesn’t have sufficient knowledge about your product. He argues because he’s convinced he is right. First what you can do is to give a positive feedback about his concerns. Then, your job is to patiently explain how your product actually works. If he still insists that he is right, sending some statistics or a link to your knowledge base might be a good idea. His concern is probably explained there in detail. There always will be types of customers who are not satisfied with your product or service. Your job is to understand them and accept it. If you manage to do that, you’ll able to effectively deal with them. And who knows, maybe one day they’ll serve you as a source of inspiration to change something in your business.